Our Western NC Mountain Cabins Rentals are located near some of the best scenery North Carolina has to offer. Nestled in the Blue Ridge Mountains, our Linville North Carolina Cabin Rentals Lake River Creek Pond are ideal headquarters from which to enjoy all of the outdoor recreation for which North Carolina is so well-known. Whether you plan to go Hiking North Carolina at Linville Gorge North Carolina, North Carolina Horseback Riding, or Fly Fishing in NC, you will want to consider staying in our ideally located Blue Ridge Parkway Cabins. One of the most popular and enduring ways to explore the wilderness that abounds around our Rental Cabins Western North Carolina is by taking a trip on the Blue Ridge Parkway. Those who stay at our Western NC Cabins are sure to be inspired by the views, the array of plant and animal life, and the feeling of seclusion that the Blue Ridge Parkway has to offer. Ideal for recreational activities like bicycling, picnicking, and photography, the Blue Ridge Parkway is just two miles from our Cabins on the Blue Ridge Parkway. Construction of the Blue Ridge Parkway began in 1935. The project was a part of the government’s efforts to put unemployed Americans to work during the Depression, and was intended to bridge the gap between Shenandoah National Park in Virginia and the Great Smoky Mountains National Park in both North Carolina and Tennessee. The project was finally completed in 1987, when the Linn Cove Viaduct was put in place. Almost three quarters of a century after its construction first began, the Parkway is still one of the most popular ways to experience nature at its most raw, and continues to draw people to our Cabins on the Blue Ridge Parkway. Our Western NC Mountain Cabins Rentals are just two miles from all of the scenic beauty that awaits those who travel the Parkway, and is a popular place for guests of our Cabins Hot Tubs for Rent Western North Carolina to explore. The Southeast’s premier scenic highway, the Blue Ridge Parkway is home to hundreds of trails, overlooks, and attractions. Ranging from leisurely strolls to strenuous hikes, each of these trails offers something unique to enjoy. From wildflowers to waterfalls, from panoramic vistas to wildlife, the Blue Ridge Parkway is an outdoor enthusiast’s paradise. Since the speed limit on the Parkway never exceeds 45 miles per hour, it is clear that the Blue Ridge Parkway is intended for sight-seeing rather than aggressive driving. Most motorists use the Parkway when they want to experience the sights and sounds of nature, as it is usually not the quickest route by which to reach any particular destination. Though many overlooks and hiking trails can be accessed via the Blue Ridge Parkway, the entire area is open for exploration; so long as you can pull your car safely to the side of the road, you are free to get out and explore almost every section of this scenic byway. The Parkway is organized via the milepost markers that mark each mile of the historic highway and all of the many different things to see can be located with the help these convenient markers. The Blue Ridge Parkway is home to a variety of unique and historical attractions and places to visit, all of which are sure to delight those who stay at our Rental Cabins Western NC. Spring, summer, winter, and fall, the Blue Ridge Parkway always offers something to guests of our Cabins in Pisgah National Forest. Spring brings warmer temperatures and is the perfect time to visit the Blue Ridge Parkway for a wildflower hike on one of the many paths and trails that meander their way through the area. The summer is a great time to hike or bicycle on and around the Blue Ridge Parkway. The high elevation of this scenic byway provides relief from the oppressive heat felt in most other areas. Because of the elevation, a variety of plant life blooms throughout the summer months, as well. 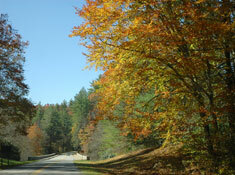 Fall is perhaps the most popular time to visit the Blue Ridge Parkway and stay in or Linville Falls Lodging. When autumn rolls around each year, the Parkway comes alive with vivid colors and tourists from all over the country flock to see it. The Parkway is open through the winter, subject to road conditions. Provided that the roads are not icy, wintertime is a wonderful time to explore the Parkway, and our Western NC Cabins provide a cozy place to come home to after a long day of taking in the winter scenery. The Blue Ridge Parkway is a fantastic tourist destination all year long, and our Western NC Cabin Rentals are located only two miles from all of the beauty and history that can be found along the 469.1 miles of road that connect Virginia and North Carolina. Our Blue Ridge Parkway Cabins are ideal for those who plan to explore the natural wonders of the area that surrounds our Linville Falls Lodging. In addition to being close to the Parkway, our Cabins in Pisgah National Forest are ideal places from which to explore all that Pisgah National Forest has to offer. Whether you enjoy Hiking Trails Grandfather Mountain NC, visiting historic sites like Biltmore Estate NC, or Fly Fishing in NC, our Western NC Cabins are the perfect Linville Gorge Lodging for you and your travel companions. When you stay with us at our Western North Carolina Cabin Rentals, you’ll enjoy all of the comforts of home, and more activities than you’ve ever dreamed of. Each season brings something new and exciting to our Western NC Cabins, and we hope that you will come back time and again to experience all of the fabulous activities Linville NC and the surrounding area have to offer.